Home » india news » Drama over Sasikala's swearing-in: is Governor wary of next week's SC verdict? Drama over Sasikala's swearing-in: is Governor wary of next week's SC verdict? Is Tamil Nadu Governor delaying Sasikala's swearing-in as CM due to impending SC verdict? Cong, BJP say TN Governor shouldn't stall Sasikala's swearing-in as CM. But why is he doing it? VK Sasikala's supporters cut a sorry figure on Tuesday. The University Centenary Auditorium in Chennai was decked up for her swearing-in ceremony as the Chief Minister of Tamil Nadu, and all national television channels were put on alert for the early morning ceremony - all in the hope that Governor C Vidyasagar Rao would return to Chennai. The Governor flew to Mumbai from New Delhi, even as the AIADMK general secretary got ready to stake claim and be sworn in in place of upstaged incumbent O Panneerselvam. This has evoked mixed reactions in political circles, with the Congress saying that the Governor should not have blocked the duly-elected AIADMK legislature party leader from assuming office without assigning any reason. While Raj Bhavan officials refused to say when the Governor was expected to return to Chennai, reports said he was seeking legal opinion on whether Sasikala should be sworn in when the Supreme Court is expected to deliver its verdict in the disproportionate assets case against her in a week. MK Stalin, working president of the chief Opposition party, the DMK, initially opposed the election of Sasikala on the grounds that the people voted for Jayalalithaa and not for her, has refrained from any comment on the latest turn of events. Initial reports said he planned go to New Delhi and meet the Prime Minister and the Home Minister. But he has apparently dropped the idea, as the DMK is always opposed to the Governor acting as an agent of the Centre. His own father and DMK president M Karunanidhi's governments were twice dismissed through blatant misuse of Article 365 of the Constitution, on the basis of the governors' made-to-order reports to the Centre. On the second such occasion, then-President R Venkataraman dismissed the Karunanidhi ministry by using his discretionary power by invoking the clause "or otherwise" in the Article, despite no adverse report from then-Governor Surjeet Singh Barnala. The Article says the President can act on the report of the Governor, or otherwise. State Congress president S Thirunavukkarasar said the impending judgement of the Supreme Court cannot be grounds to frustrate the wish of the elected representative. "It is not for him to judge whether she is fit to be Chief Minister. He should have left it to the people to decide," he said. Thirunavukkarasar said Sasikala had been acquitted by the Karnataka High Court in the assets case, and delaying her assumption of office in anticipation of an adverse verdict by the apex court on the Karnataka government's appeal in the same case is untenable. Unlike Thirunavukkarasar, his party colleague and former Finance Minister P Chidambaram, in a series of tweets said that while the AIADMK was well within its rights to elect Sasikala as its leader, the people also had the right to ask whether she deserved to be CM. He further said the AIADMK and the people were moving in opposite directions. BJP Rajya Sabha MP Subramanian Swamy, who initiated the prosecution of Jayalalithaa and Sasikala in the assets case in the 1990s until it was taken over by the Karnataka government, said the Governor's action was unconstitutional. "She was elected by the AIADMK legislature party. If people do not like her, let them vote her vote out when she seeks by-election after assuming office," he reasoned. As for the verdict in the assets case, expected in a week's time, he remained positive that Sasikala would go to jail. 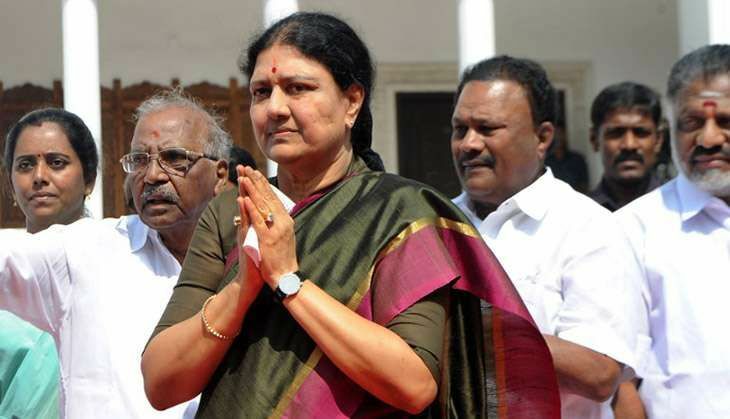 Satta Panchayat, an NGO, has filed a petition in the apex court to stay the swearing-in of Sasikala till the outcome of the assets case is known. It has contended that in case the verdict goes against her and she stands disqualified as CM, it could lead to a law-and-order problem. It remains to be seen whether the apex court will entertain the petition. Pattali Makkal Katchi leader and former Union Minister Anbumani Ramadoss has also said the Governor should wait for a week till the apex court verdict is known. TWEET THIS Is Tamil Nadu Governor delaying Sasikala's swearing-in as CM due to impending SC verdict? Cong, BJP say TN Governor shouldn't stall Sasikala's swearing-in as CM. But why is he doing it?